Lidget Compton was formed from the successful merger of Compton Buildings and Lidget Concrete in 2011. Both market leading companies in their own right, with a combined experience in the garage market of nearly 90 years, the combination has created a company which is the largest in the UK and is genuinely market leading. Our product range is second to none. We have a bigger product range, we offer more flexibility, and we have a range of unique walling finishes. Our Patented Brick and Stone wall finishes (Patented GB2455317) gives a factory applied finish that transforms the building. 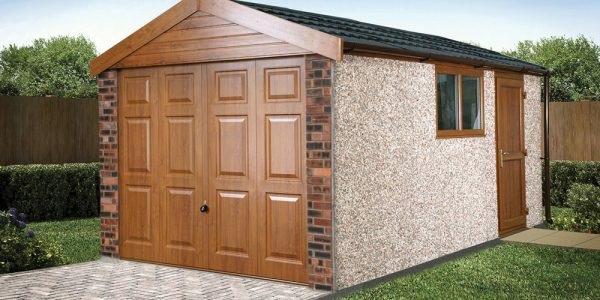 Our Garden Room range shows just how flexible our buildings can be, and if you want a building not included in our comprehensive standard range, just talk to our Design&Build department. Local Authorities require buildings of a certain size and position to be designed to a certain standard, and need a certificate of compliance with local Building Regulations. Failure to get the correct certificate can result in problems selling the property in the future, or in severe cases, result in the building being taken down. Your local Lidget Compton agent should be able to provide some advice on this. If in doubt, contact your local authority. Their building and planning departments will be able to give you all the advice you need. Most local authorities have comprehensive information on building regulations on their website. The governments planning portal also contains simplified building regulations guidance for general public use. We recommend this should be your first line of enquiry when looking for building regulation information. Please note that the planning portal only covers building regulations in England & Wales. Residents in Scotland should contact their loal authority directly. Building Regulations have a number of purposes. Firstly they set out the minimum standards of design and building work for the construction of domestic, commercial and industrial buildings. They also define what is regarded as ‘building work’ and the procedures for ensuring that it meets the standards laid down. In essence they exist to ensure the health and safety of people around buildings, but they also exist for other reasons such as ensuring disabled people have appropriate facilities and access to buildings and even for the conservation of energy. So if you are unsure whether your building needs building regs, contact your local agent, local authority or contact us direct. Click here to go to the government’s Planning Portal, where you will be able to see what is required. Please note that the Planning Portal only covers England and Wales. If you are in Scotland you will need to contact your local council for advice. Your Lidget Compton agent will be able to help you with planning permission issues.